Crocheting is nothing new. It is one of the simplest handcraft techniques and everybody can do it. The unique connection of crocheting and the use of a flexible stringing of seed beads form the Preciosa Traditional Czech Beads brand will give rise to an interesting and effective result which will surprise everybody who tries it. All that is needed is sufficient numbers of seed beads in various sizes and colors, a flexible stringing material and a medium sized crochet hook combined with the necessary dose of playfulness and an interest in the creative result. You will be rewarded with the enjoyment of an easy procedure which results in an impressive product. 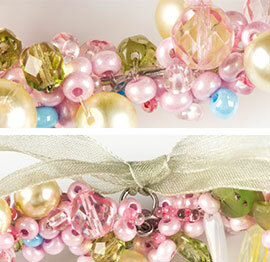 String a crocheted flexible seed bead stringing on to a shaped wire and create a cute, colorful spring decoration. We wish you many happy hours of beadwork with seed beads from the Preciosa Traditional Czech Beads brand. The basis for the effective result when using this technique is the regular layout of the seed beads which will subsequently be strung and used for crocheting. We have alternated various types of seed beads and beads in our example. The leaves and tabs will only be added at the beginning of the stringing (figure no. 1). Unwind the flexible stringing material from the bobbin and string ca 1.20 m of string beads. Do not yet cut the stringing material from the bobbin. Take the hook and make the basic loop at the start of the stringing (figure no. 2). Create each next loop after the designated number of strung seed beads. Here, we have separated three pieces and crocheted a further loop onto the flexible stringing (figure no. 3). Proceed in this manner until all the strung seed beads have been crocheted. When crocheting, tighten the stringing slightly so that sufficient strength is guaranteed while at the same time ensuring the flexibility of the crocheted stringing. The crocheted seed beads will measure ca 25 - 30 cm depending on how tight the stringing is. Now cut the stringing material from the bobbin with a reserve of approximately 8cm and pass the end through the last loop. Bend the wire in half and create a loop on one end with the linking pliers. Bend both ends of the wire equally into the shape of a heart. String the crocheted stringing onto a shaped wire using the individual crocheted loops (figure no. 4). Complete the heart with a loop which is created perpendicular to the loop on the other end of the wire. Thread the ribbon through this new loop and tie a bow.